This unprocessed image of Prometheus was taken by Cassini on Jan. 27, 2010. The image was taken in visible light with the Cassini spacecraft narrow-angle camera. The view was obtained at a distance of approximately 36,000 kilometers (23,000 miles) from Prometheus. Newimages from NASA's Cassini spacecraft offer close-ups of two of Saturn's moons. Thepictures, raw and unprocessed, were released today. Apicture of the moon Prometheus was taken from a distance of about 23,000 miles(36,000 km). 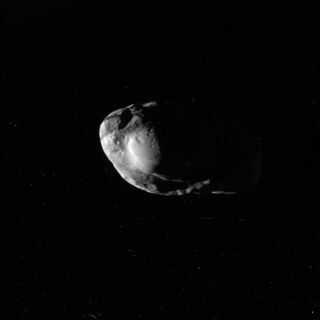 Prometheus is a potato-shaped satellite is about 63 miles (102 km)long. It is embedded inSaturn's rings. Aphoto of Dione was mad from about 29,000 miles (46,000 km) away. Dioneis an icy ball. It has a radius of 348 miles (560 kilometers) and orbits Saturnevery 2.73 days from 234,505 miles (377,400 kilometers) away. Dione'saverage surface temperature is minus 303 Fahrenheit (-186 Celsius). It iscovered by smooth plains and not too many craters ? all a sign ofcryovolcanism, or an outpouring of icy liquid from the interior.